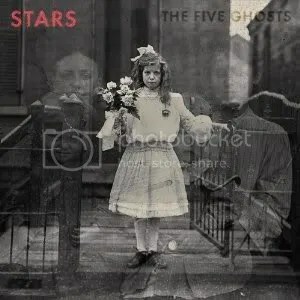 Fifth full-length from Canada’s Stars. For me, this band is the perfect soundtrack to cold winter nights spent dreaming of your crush. I’ve always described them to others (okay, maybe just myself) as having a romantic sound. Their sound is just so warm and welcoming and Amy Milan’s angelic voice plays perfectly off of Torq Campbell’s. Great for indie kids to make out to and fall in love to. They also have their fair share of songs that will be great background noise for you while cry over the fact that you’ve broken up with said indie kid counterpart. Anyway, I’d file them under Canadian-romantic-indie-synthpop-pop-rock (not that I actually WOULD file them under that, because that would just be a ridiculous way to organize my music collection). The Five Ghosts starts off strong with “Dead Hearts” which is followed by a few great songs (I especially like “I Died So I Could Haunt You”). But by the time I’ve gotten through the fifth track, “We Don’t Want Your Body”, I feel like they’ve spent their tank of gas and are just running on fumes. I think the material on this album could have made for a killer EP. As a full-length album, it just doesn’t hold up – especially when we know what Stars are capable of from their past releases. This entry was posted on June 30, 2010 at 12:00 pm and filed under TheSlacker. You can follow any responses to this entry through the RSS feed.